Squirrels require a predictable abundance of food to survive cold weather. They feed on nuts and fruit from forest trees, including hickory, oak and beech trees. Throughout the year, squirrels also dine on caterpillars, buds, mushrooms and tree flowers. This high-calorie diet provides a buildup of fat that the rodents need to survive cold winter nights. Squirrels build dwelling structures such as dens and nests that are especially beneficial during winter. Eastern gray tree squirrels stay in their nests or dens to conserve body heat during cold temperatures. Nests are built from leaves and sticks that are densely packed, providing a strong, weatherproof structure. Dens provide a food chamber as well as protection from cold weather. The dens are holes constructed in living trees, frequently expansions of woodpecker holes. 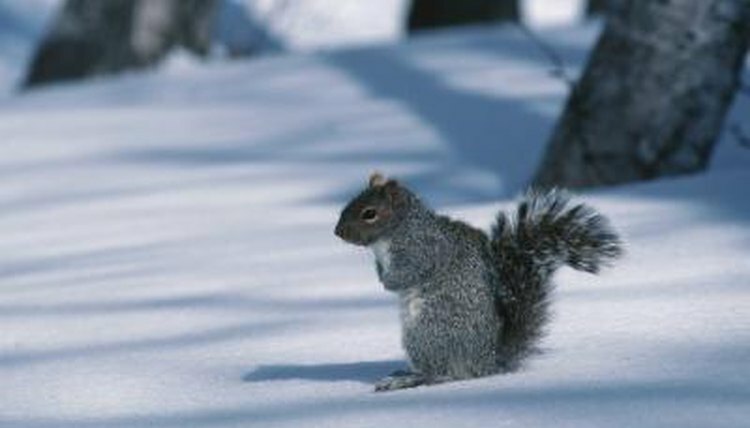 The Eastern gray squirrel does not hibernate; however, it will remain in the nest or den during cold weather, leaving it only to forage once the food supply has diminished. Ground squirrels dig burrows in the ground to create a warm, safe retreat. They have good claws for digging. The round-tailed squirrel hibernates during the winter months, while the rock squirrel ground species retreats to its burrow for long cold months, leaving the burrow only to seek food. Red squirrels are found in mountain ranges, pine forests, mixed forests and polar environments as well as temperate climates, with a preference for cold weather. They are commonly seen in urban and suburban areas near dense forests. The red squirrel grows tufts of fur on its ears during the winter months to help keep them warm. The majority of its harvest comes from foraging during the autumn and summer months. These squirrels hoard up to two seasons' worth of food to be consumed during the winter. During the winter months the red squirrel is active and forages daily. Once the weather dips below freezing the red squirrel stays in the nest and is completely inactive until the temperatures get warmer. Rocky mountains and regions with dense forests filled with fir, spruce and beech maple trees are preferred habitats of the Northern flying squirrel. They feed on fungi, cones, conifer, seeds, sap, buds, nuts and small insects. Northern flying squirrels travel or tunnel through snow when foraging for food. They remain in their nests during winter months, leaving only to forage for food. Northern flying squirrels have gray-and-brown fur on their upper body and white hair on their belly. A fleshy membrane extends from the ankles of the hind leg to the "wrist" of the front leg, allowing them to easily glide from tree to tree. Lincoln Park Zoo: What Do Squirrels Do in Winter?